What's Really in an Automotive Digital Menu Board? 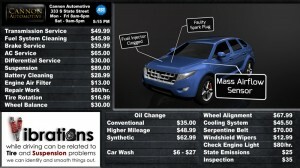 - AutoNetTV Media, Inc.
What’s Really in an Automotive Digital Menu Board? Most of us are familiar with digital menu boards at restaurants and such, but may not know what to expect of an automotive specific application. Check out this short sample of AutoNetTV's Digital Menu Board. Note the various templates or layouts. The pricing is customizable. Also note the various images, videos and 3D animations that play in various panels in the templates. What plays in these content windows is selected by the service center. Promotional assets can also be customized. For more info, check out this webpage or give us a call at 877-642-3555.